Let's face it - we all want a new Dino Riders toyline to come out but things aren't looking so good for us right now. The re-release of many old toylines has certainly been the trend over the past few years. For example, Ninja Turtles and Masters of the Universe have recently been revived with great success. 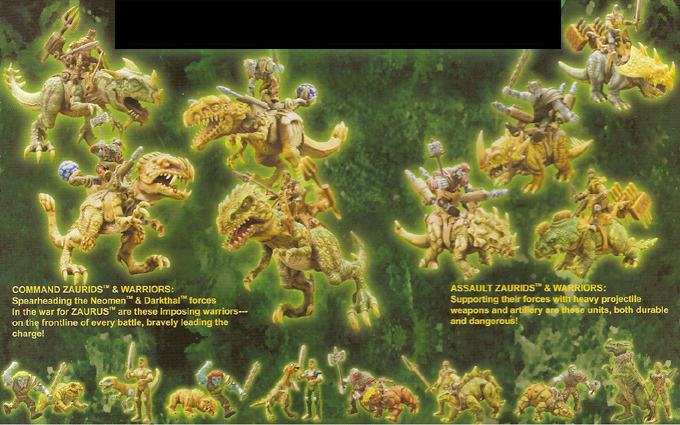 However, Dino Riders were not nearly as popular as those toylines so the odds of a re-release aren't very high. But then again, one never can tell and perhaps we will see a new series released in the future. Until then, we need some temporary substitute to fill the void. Enter Dino Warriors - a new toyline released by Panache. The overall concept is the same - combine dinosaurs with weaponry. The storyline is very similar as well. It's your typical good versus evil where the good guys lived in peace and prosperity for many years until one day the evil forces decide to attack them and attempt to rule the planet. Sound familiar? Although technically not dinosaurs, the Dino Warrior beasts are loosely based off real dinosaurs. Whereas Dino Riders stressed scientific accuracy with its toys, the creatures in Dino Warriors look like mutated dinosaurs with very exaggerated features. Think dinosaurs breeding with aliens and you'll get the picture. The figures are also small like the Dino Riders figures but they are slightly taller and definitely bulkier. The good guys come in two basic forms - native American (Turok) style and a medieval knight style. The bad guys basically looks like ogre rejects from Dungeons & Dragons. The toys are very detailed and interesting. There are two series worth of the toys and all are documented here for your viewing pleasure. There are three basic assortments. The smallest assortment retails for about $7.99 and consists of 8 small creatures each with their own figure. The medium size assortment retails for about $14.99 and consists of 4 medium sized 4-legged creatures each with their own figure. Finally, the large size assortment retails for about $19.99 and consists of 4 large two-legged creatures each with their own "leader" figure. Also, unlike the Dino Riders where there were a different number of good guys and bad guys, Dino Warriors splits each assortment equally so in total, there are 8 good guys (Neoman) and 8 bad guys (Darkthal). The original plan was to release these toys as a Target exclusive for the first few weeks of their release and then offer them in other places such as Toys "R" Us. However, it seems that these toys are a Target exclusive through and through. I have thus far only seen these toys available at Target and nowhere else. I have the entire collection and I think they are pretty cool. They aren't as good as Dino Riders by any means but they are certainly cool toys in their own right. Until a new Dino Riders toyline is released, these will have to do . . .
On a faraway planet called Zaurus, a noble race of humanoids called the Neomen live among the intelligent dinosaur-like creatures called Zaurids. Using the awesome power of these giants, the Neomen build and defend an exotic civilization that lives in harmony with nature. For generations, their world prospers - until a warlike enemy from the dark side of the beautiful "jungle moon" pays the Neomen an unwelcome visit. They are the Darkthal Horde - man-monsters possessing keen intelligence, brutal weapons, and riding their own species of vicious Zaurids. Their ultimate goal - take over the Neomen's resource-rich territory to replace their own dying lands and found a new Darkthal kingdom. Who will win this epic battle of good vs. evil, man vs. monster?